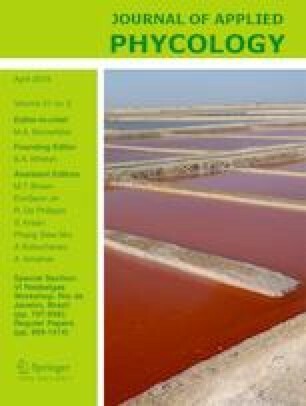 Although Ascophyllum nodosum, a brown seaweed (Phaeophyceae) of the family Fucaceae, is widely used in companion animal products, few studies have attempted to evaluate its influence on foodstuff palatability. This study investigated the effect of A. nodosum on extruded dog food palatability using the split-plate test. Eleven naїve dogs were used. Ascophyllum nodosum (AN) palatability was evaluated across separate tests for three pairwise comparisons between a control extruded food (CTR) and two experimental foods, obtained by adding A. nodosum at low (0.3%, AN-low) or high (1.0%, AN-high) concentrations to the CTR food. Food intake within the first 5 min and first choice eating behaviour was recorded. Differences in food consumption were only registered where the CTR and the AN-high foods were compared (21.11 vs. 7.62 g kg−1 BW0.75; P < 0.001). The intake ratio, calculated as consumed food (A/A + B), confirmed this trend (0.75 vs. 0.28; P < 0.001). No differences were found in first choice behaviour in any palatability test. The results suggest that A. nodosum shows an inhibiting and dose-dependent effect on the dogs dry matter intake. Data obtained from the first choice behaviour evaluation also indicate that negative effects exerted by A. nodosum on palatability are primarily related to gustatory factors rather than to olfactory stimuli. The authors would like to thank Dr. Gabriele Mannucci and Landini Giuntini S.p.A. for providing the experimental diets. They are also grateful to Mrs. Marzia Bellon for her valuable support during the experiment and to Dr. Andrea Giontella for his high quality contribution in statistical elaboration of the data. The present study was approved by the Ethics Committee of The University of Perugia (2018-04R). Operative procedures and animal care were performed in compliance with the current legislation on companion animal welfare (Law N. 281 of 14 August 1991; Regional Law N. 10 of 17 August 2016). Operators involved in the trial received appropriate training with respect to safety procedures and animal well-being.